"Messages from home let us know we are not forgotten. Every card we read helps us to feel respected and appreciated for serving our country." With the holiday season upon us, Maritz people had an opportunity to pause, take a moment to give back and say thanks. 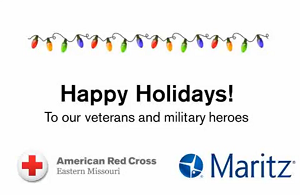 Over the course of a week, we participated in the Holiday Mail for Heroes campaign, sponsored by the American Red Cross, and sent more than 1,200 holiday wishes and thanks to members of the military, veterans and their families. Sending holiday mail is an easy but meaningful way to give back to our nation’s two million service members and 24 million veterans. The cards not only allow communities to express gratitude, but they also provide a “touch of home” to deployed service members and a comforting message to their families and our veterans. And it was a hit for the Maritz team. Many employees commented on how much they appreciated the opportunity to show their support for the military in this manner and were proud to work for a caring company like Maritz. The Holiday Cards for Heroes campaign is a result of our deeper non-profit partnership with the American Red Cross. Maritz is among several corporations in St. Louis to join the Ready 365 Program, in which we “pre-invest” with the Red Cross to ensure they can be ready 365 days a year and in a moment’s notice in times of disaster. We’re proud to be part of the American Red Cross family, one of the largest humanitarian forces in the world. And we are incredibly grateful for the opportunity to send some holiday cheer to those people who sacrifice so much for our country. Watch our people express their well wishes and gratitude to our military members. Interested in supporting the American Red Cross, check out their website to learn more about how you can get involved.